K1BL - G & W Machinery Sales, Inc. 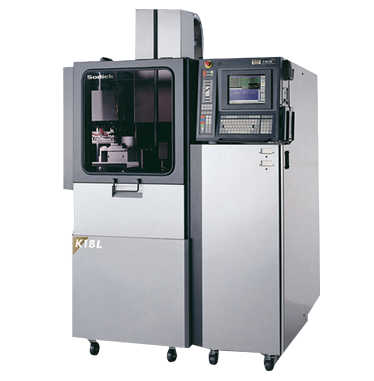 The K1BL linear motor hole popper EDM is ideal to use for boring high precision holes into hard to machine materials. Sodick’s Linear Motor Drive is on the Z-Axis of the K1BL Hole Popper. It is ideal to make microscopic holes that have been impossible to make with conventional machines. In addition, the highly responsive servo system boosts machining speed and reduces electrode wear. The K1BL achieves microscopic holes. The gantry style structure has a main column that is supported by two columns that feature high rigidity and stable machining at all times. In addition, constant accuracy is not affected by thermal distortion. The K Series features energy-saving designs and technologies. Compared to conventional EDMs, the Sodick Small Hole EDM Range can reduce average energy consumption by up to 60%. The ATC automatically changes pipe electrodes to support continuous automatic operations and multi-hole machining.